This video was published to Youtube 020219 by MrSemensemenych. It features some great shots of this Futuro, both exterior and interior, as well as some nice aerial footage showing the location of the Futuro relative to other structues and the landscape around it. 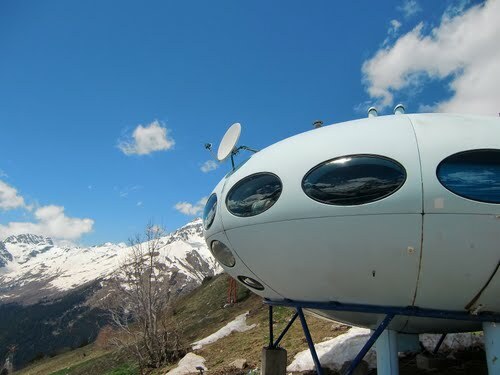 It is always nice to get a recent look at a Futuro. These great shots of this Futuro were captured by djigstar on 092318. Came across this unusual photo on Instagram the other day; the photo is by Kirill Grekov and was posted to Instagram 032517. 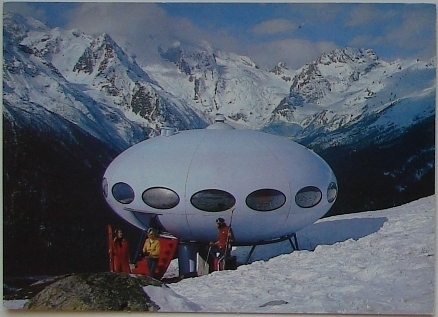 Never seen a view of this Futuro that looks remotely like this; looking at the aerial map top right there were some buildings close to the Futuro at the old location but none of the photos suggest this location so I am assuming this is a photo shot at the new location a little further up the mountain 032517. 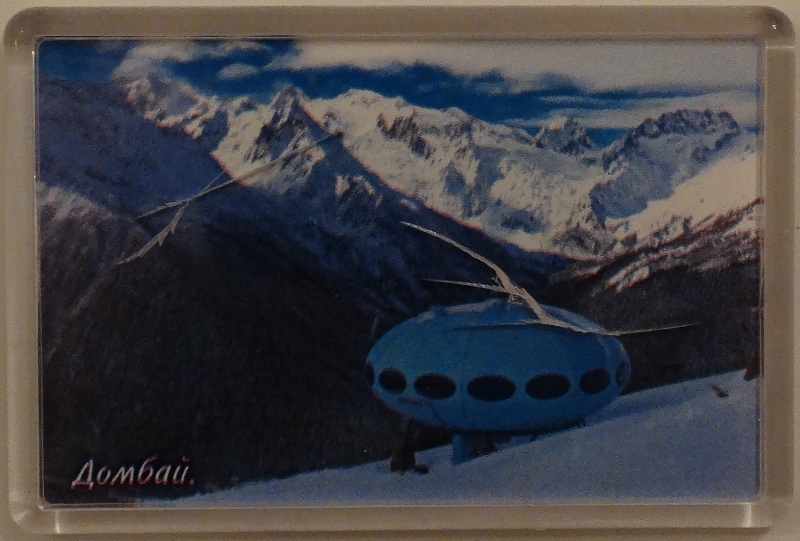 Recently I added a couple of items to my collection of "Things Futuro" that feature this Futuro. 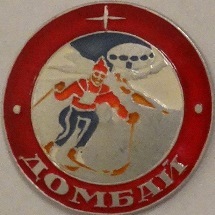 The pin to the left that features a skier with the Futuro in the background is 2" in diameter. I do not know if the item is contemporary or from some time in the past. 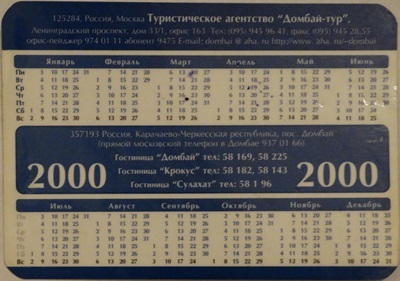 The wallet calendar shown below is for the year 2000 though there is no indication as to whether the photo featured on the front is from 2000 or some earlier date. 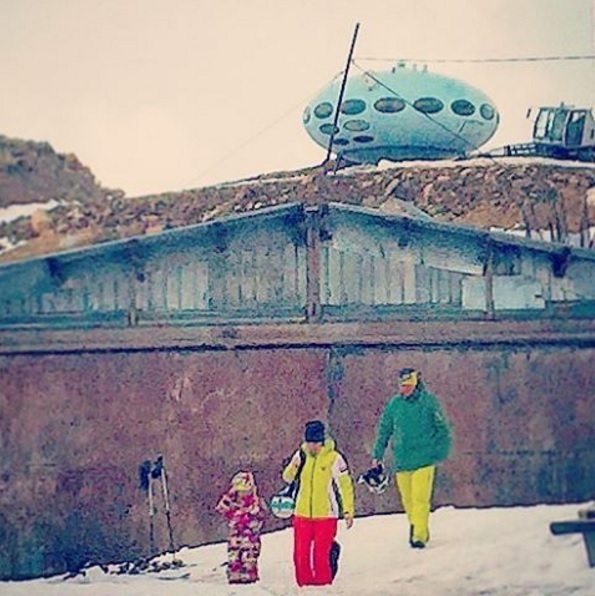 Dmitry Yakubovskiy posted the two photos below to Instagram which show the Futuro at its new location a little further up the mountain. Looking at the photos this location appears to be flatter than the previous location. Dmitry's original images can be found on Instagram here and here. Links to the two videos below, which also show the Futuro in its new location, were posted to my Facebook Page yesterday; thanks for the "heads up" Yves. 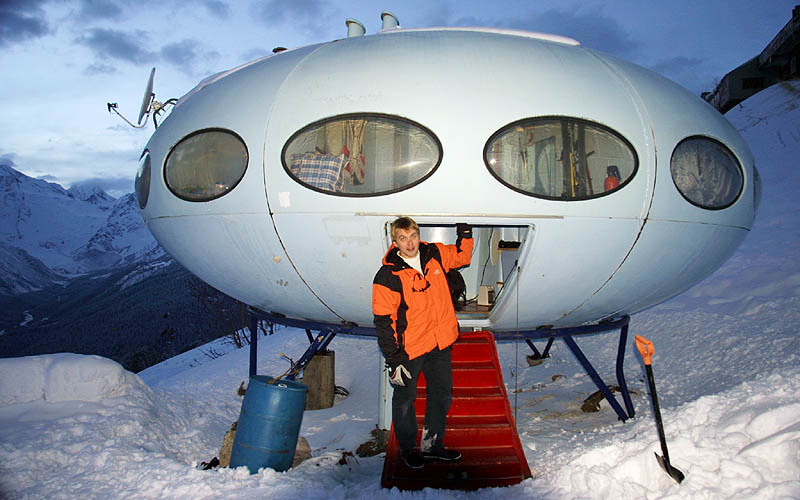 The first, from Russian TV station Архыз 24, includes footage of the Futuro being moved as well as both exterior and interior footage of the Futuro at the new location. 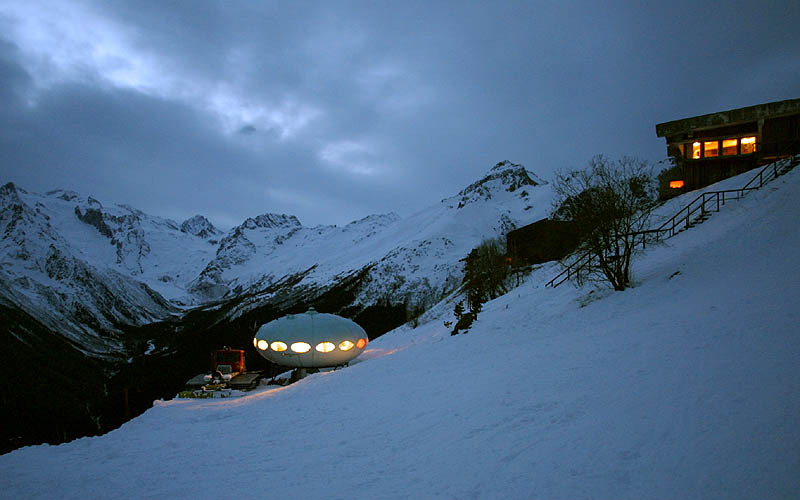 The second, a snowboarding video, shows the Futuro in passing at 2:52 [follow this link to go right to that point in the video on Youtube]. I recently came across the video below that was posted to Twitter 103016 which shows this Futuro being moved to a slightly different location. 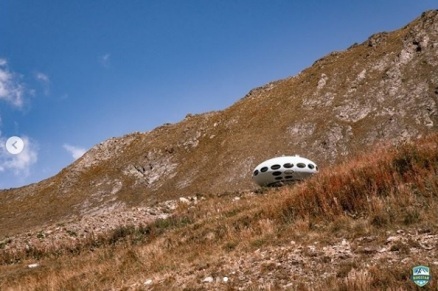 According to an article on the website stav.aif.ru the Futuro was being moved 250 meters further up the mountain. 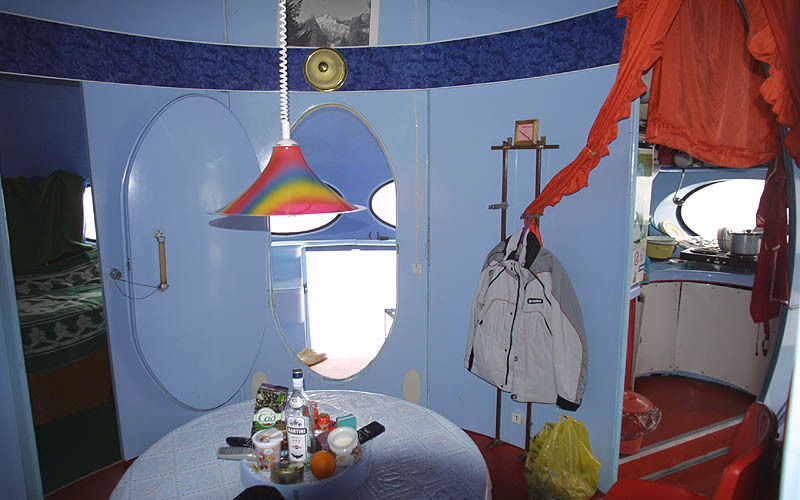 The move was aimed at making the Futuro more accessible to visitors according to Erol Aybahanov, mayor of the village of Dombai. 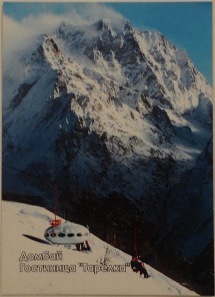 The method of transport was a first, at least as far as I know, but given the location not at all surprising. 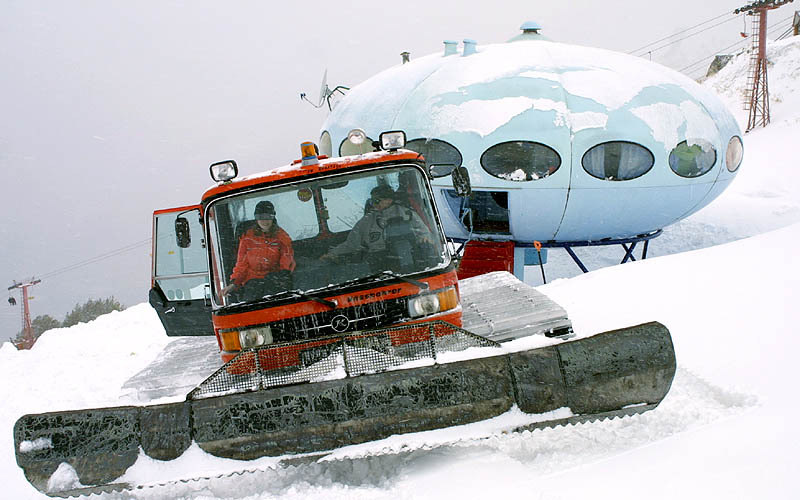 As can be seen in the video the Futuro was dragged across the snow and ice by a heavy excavator. Though it is not clear in the video presumably there were "skids" of some type installed under the legs to facilitate moving the unit in this way. Purchased this 3" by 2" plastic refrigerator magnet recently. 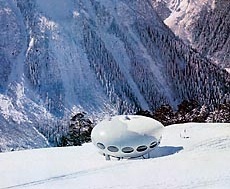 It carries a photo of this Futuro. 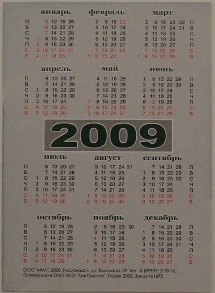 There is no indication of date of production on the object. 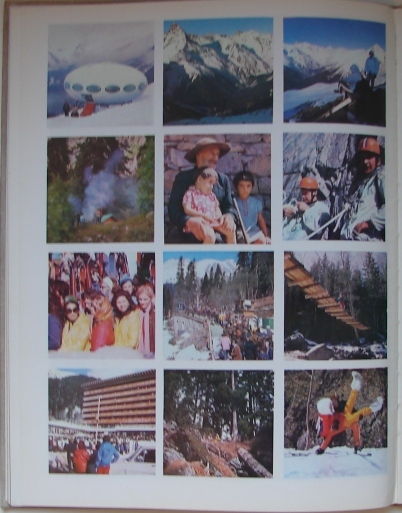 The photos below are of a print that combines photos of this Futuro and a skiing scene into a single photo. 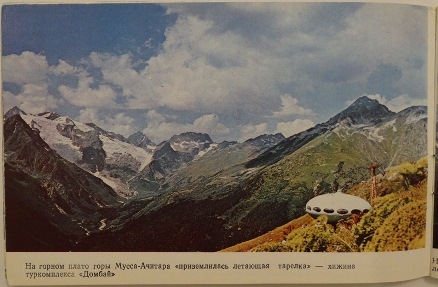 The text on the rear [according to Google Translate] identifies the Futuro as a "tourist hut" and places it "In the mountains of Karachay-Cherkessia". 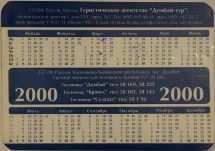 The copyright line dates to 1983. 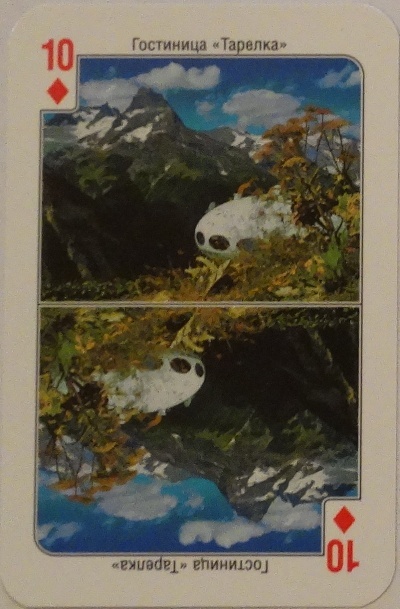 It is unclear if this is the date of the original photo(s), the date of production of the combined print or both. Given the presence of this printing on the back it seems likely to me that this was produced as a souvenir item. 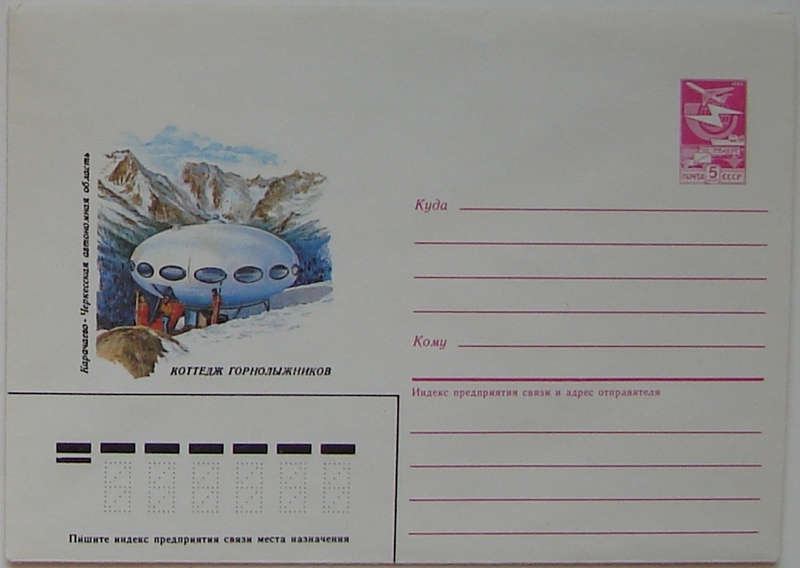 It could probably have been used as a postcard though I do not believed it was designed as such given the shape of the print and the absence of the usual printing seen on the reverse of a postcard for address, message and postage stamp placement. 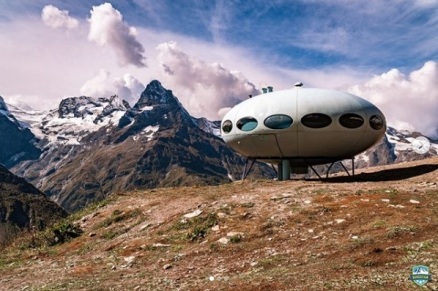 This week I added a nice photo set to my collection of "Things Futuro". The set is undated but was likely manufactured within the last few years [and it is possibly still in production; my Russian contact purchased it directly from the manufacturer]. 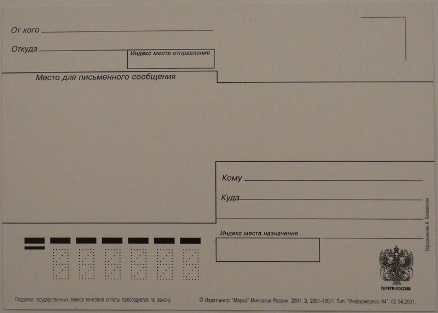 It includes a cover/folder and 12 individual cards. 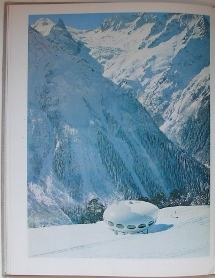 This Futuro is featured on the cover and one of the cards. 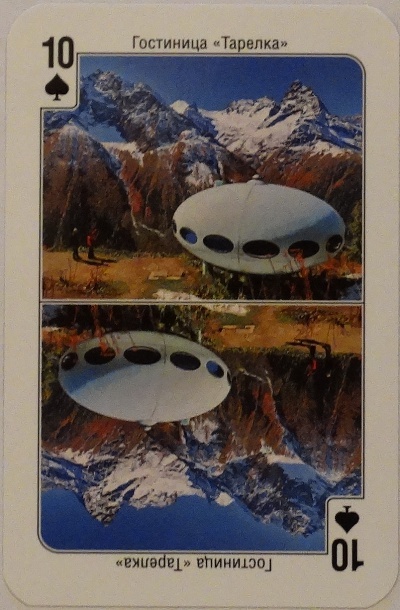 There seem to be more collectibles and souvenirs, both vintage and contemporary, featuring this Futuro than any other Futuro, at least based on the research I have done while assembling my collection of "Things Futuro". 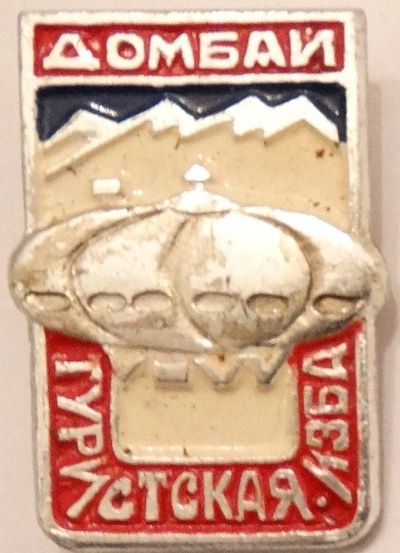 This lapel pin is one such item. Presumably manufactured as a tourist souvenir this lapel pin is small [only 1.05 inches by 0.65 inches] and light. 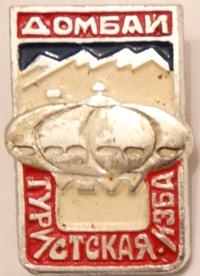 The pin features a Futuro and the text "ДОМБАИ - ТУРИСТСКАЯ ИЗБА" which, according to Google, translates to "Dombai - Tourist Hut". The Dombai Futuro more so than any other Futuro appears on all sorts of collectibles and memorabilia. This week I was able to add several new items to my collection. 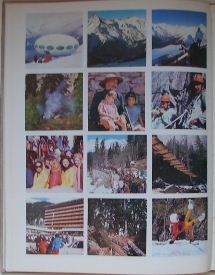 From top to bottom these are a 2001 postcard [front and back], a 1983 photo/tourist booklet [cover and interior page] and and a 2009 wallet/pocket calendar [front and back]. 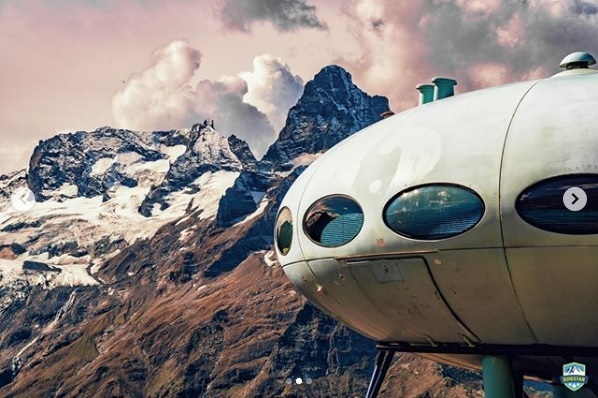 Yves Buysse sent me links to a couple of rather cool 360° photos of the Dombai Futuro; you can rotate through 360°, zoom and so on [thanks Yves]. 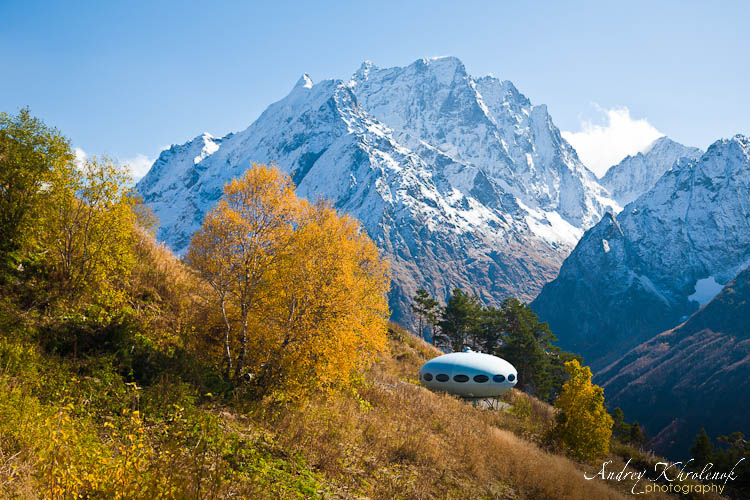 The first, by Alexander, can be found on 1panorama.ru and the second, by Alexey Abrazumov, uses Google Photo Sphere and can be found here. 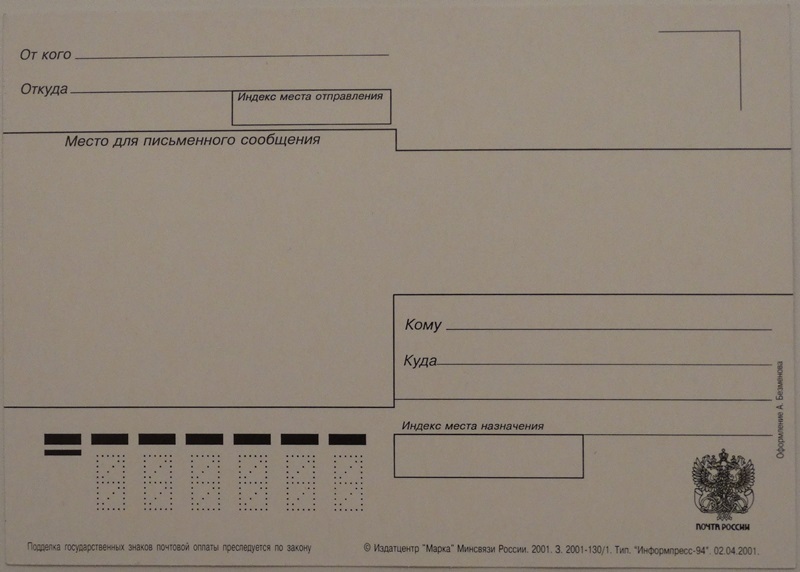 I personally think the end result is far better in the first but a quick look at the "how to" on 1panorama.ru suggests that creating that end result is quite complex. Google Photo Sphere looks like it is probably a much simpler and accessible process with the "tech" doing most of the work. The reverse also carries a copyright line that dates to 1983. 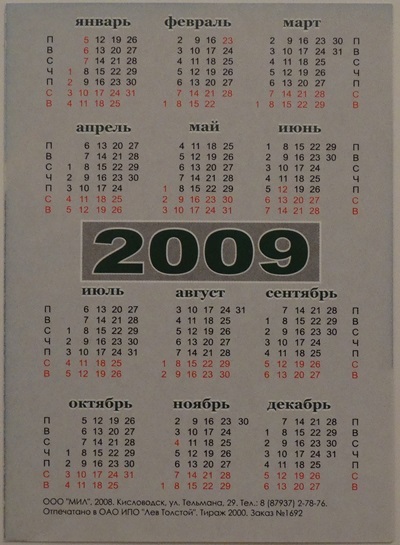 It is unclear if this is the date of the original photo(s), the date of production of the combined print or both. 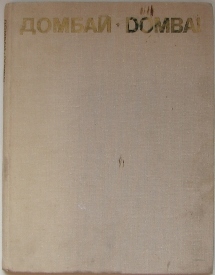 Given the presence of printing on the back it seems likely this was produced as a souvenir item. It could probably have been used as a postcard though I do not believed it was designed as such given a slightly less "hardy" print medium than a standard postcard, the shape of the print and the absence of the usual printing seen on the reverse of a postcard for address, message and postage stamp placement. The photos below are screenshots from a Finnish TV show broadcast 010715. 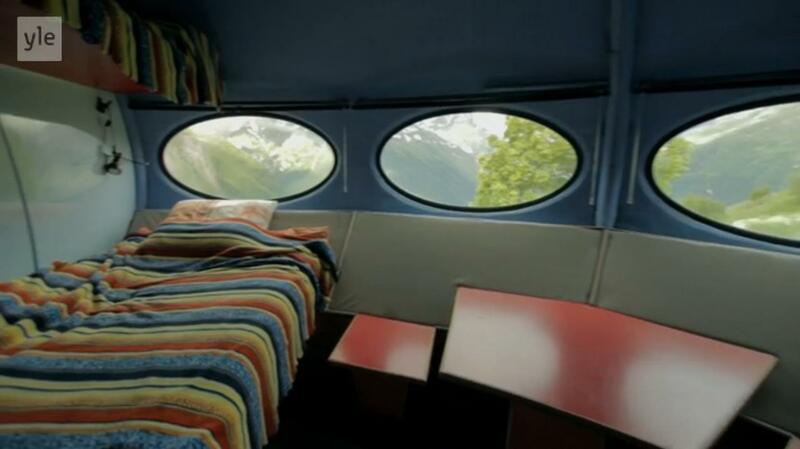 The show was the first episode of the series Kaukasia 30 päivässä [Caucasia in 30 Days] and will be available streamed from the TV show's website until 041215. 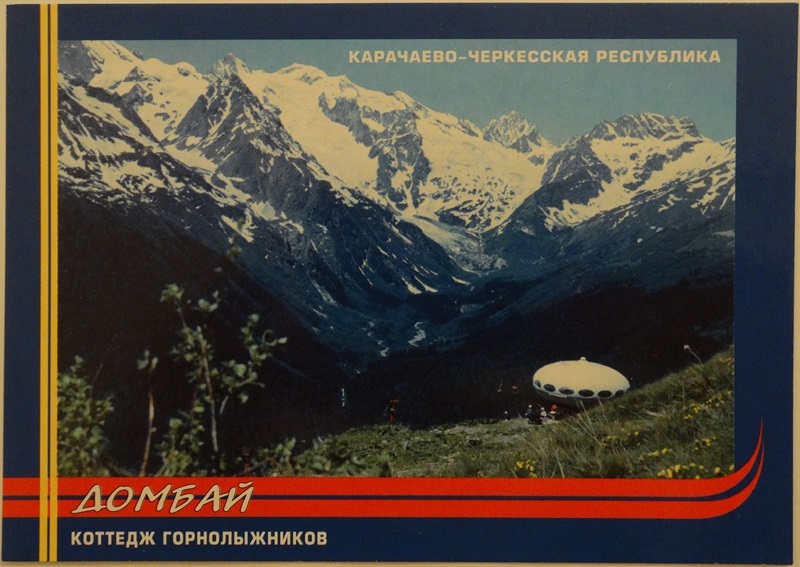 I came across the rather cool photo below the other day on LiveJournal; it was posted on this page by raduga_nk and the comment attached to the photo suggests it was taken 30 years ago. I cannot seem to figure out how to request permission to use the photo here, perhaps you need a LiveJournal account [which I do not have] to contact the user, so if this is your photo please contact me so I can provide proper attribution. 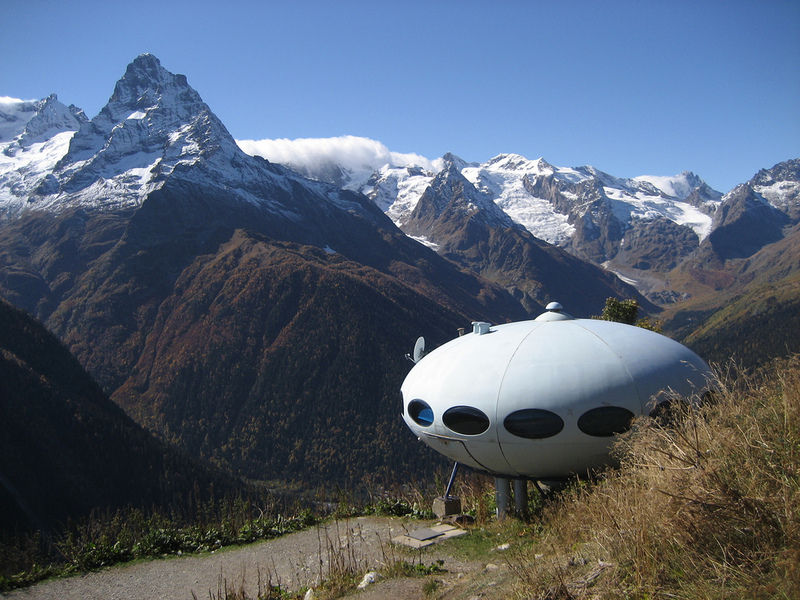 The same day I also came across this video which provides some new [at least to me] footage of this Futuro. 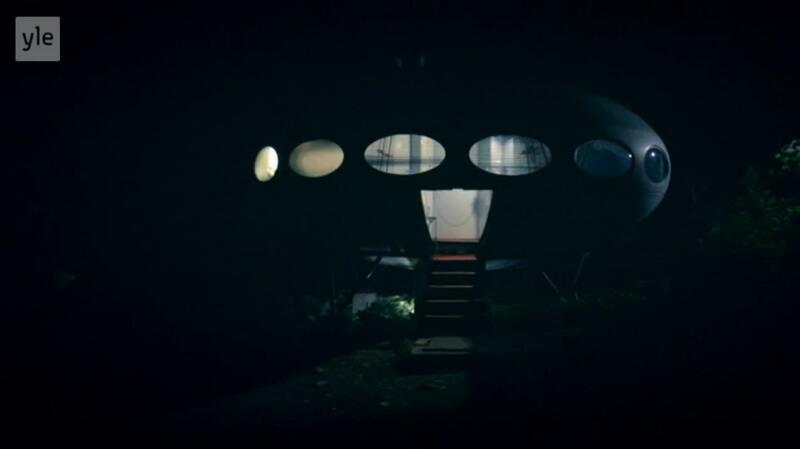 The video was posted by Marc Seven on 020911 and is titled "Disco Voador Na Montanha" [Google Translate indicates this is Portuguese and translates it to "Flying Saucer On The Mountain." 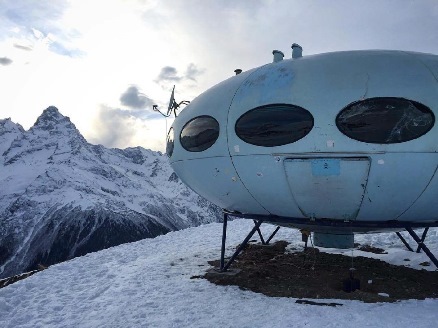 Seven comments [translation by Google Translate] that "I found a flying saucer in the Alps Caucasus A hotel for 8 people, used in seasons of skiing." The video is shot largely from a single angle and is somewhat unsteady at times but it does provide some nice new footage of this Futuro. I was sent a link to this video the other day by Yves - thanks Yves. 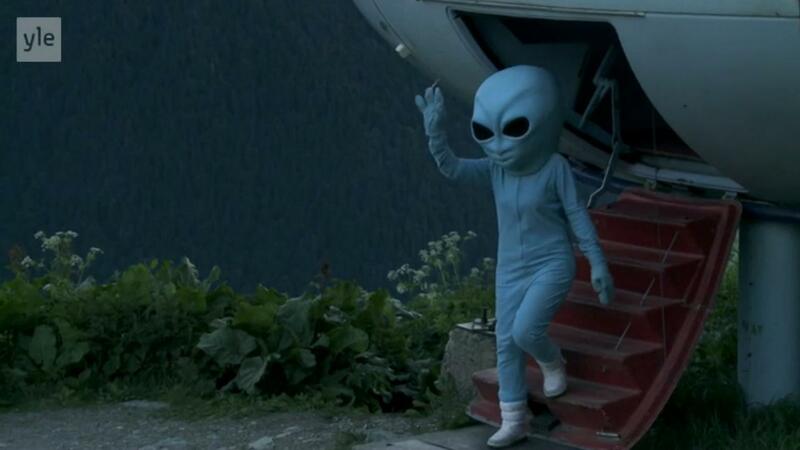 The video is Russian with a soundtrack that, in my opinion, would make the voices difficult to hear even if I spoke Russian so I have no idea what is being said. 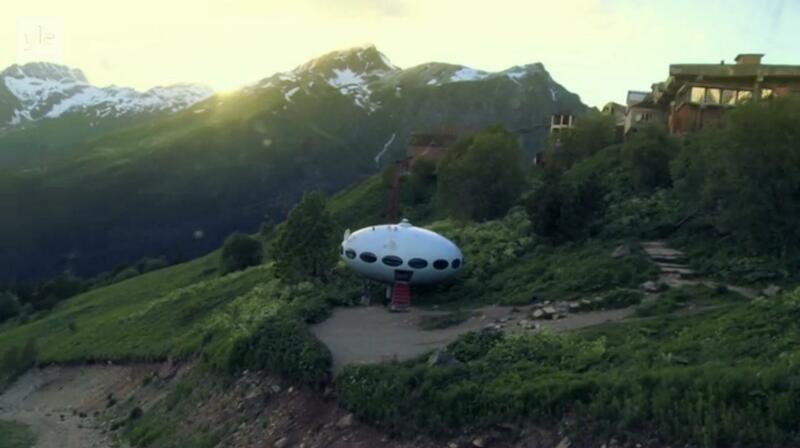 It features footage of the Futuro starting at 5:57. Google Translate suggests the video is titled "Golden Autumn Dombae! Ken Moussa Achitara" and the one comment translates to "A trip to the Caucasus region-Teberda Dombay, October 2012". 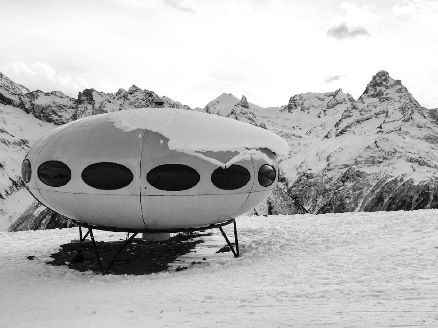 This photo, one of the best photos of the Dombai Futuro I have seen, was taken by Socialism Expo and is displayed here under CC 2.0. 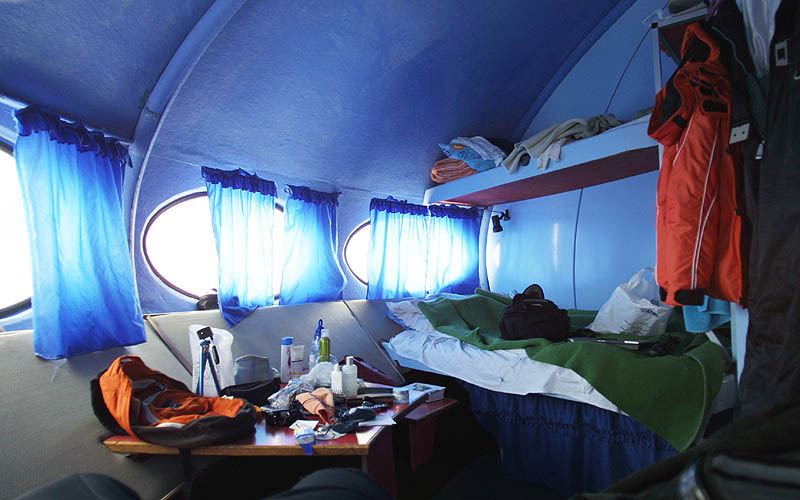 The excellent series of photographs shown below were taken between 022204 and 022804 by Sergei Novikov. 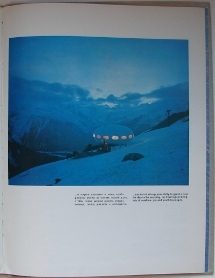 The images were posted on his website novikov.com and can be found on this page and the subsequent pages. 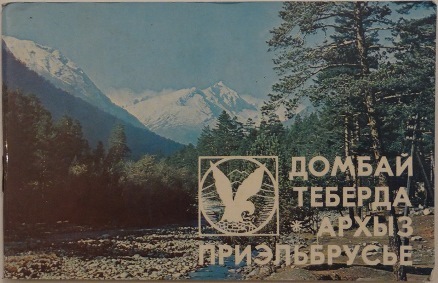 The photographs are displayed here in accordance with the novikov.com copyright terms. This image by Andrey Khrolenok is the most recent I have been able to find and places the Futuro still on site 030411 [Displayed here under CC 2.0]. 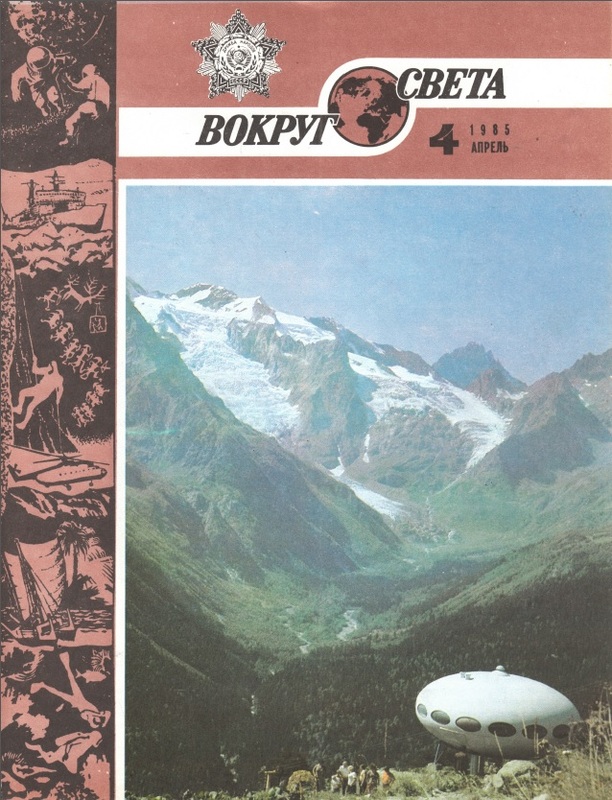 Вокруг Света or "Around The World" is Russia's oldest popular science and regional studies journal and, with a couple of breaks [1918-1927 & 1941-1945] has been published continuously since 1861. 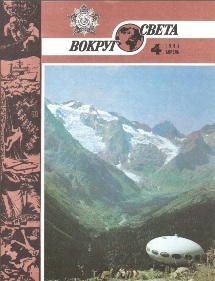 The April 1985 issue, #2535, featured this Futuro on the cover. A copy of the magazine in .pdf format can be downloaded here. There is little mention of the Futuro inside the magazine but what there is, a description of the cover in the contents section, is very interesting. 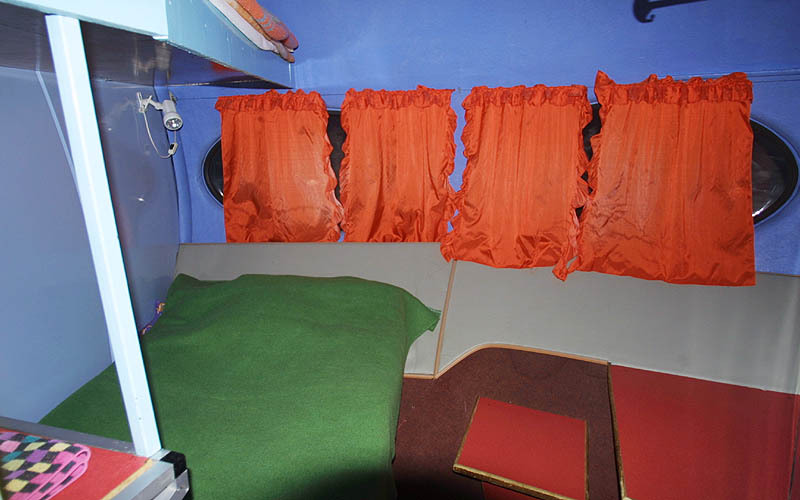 Here is the station control and rescue service. 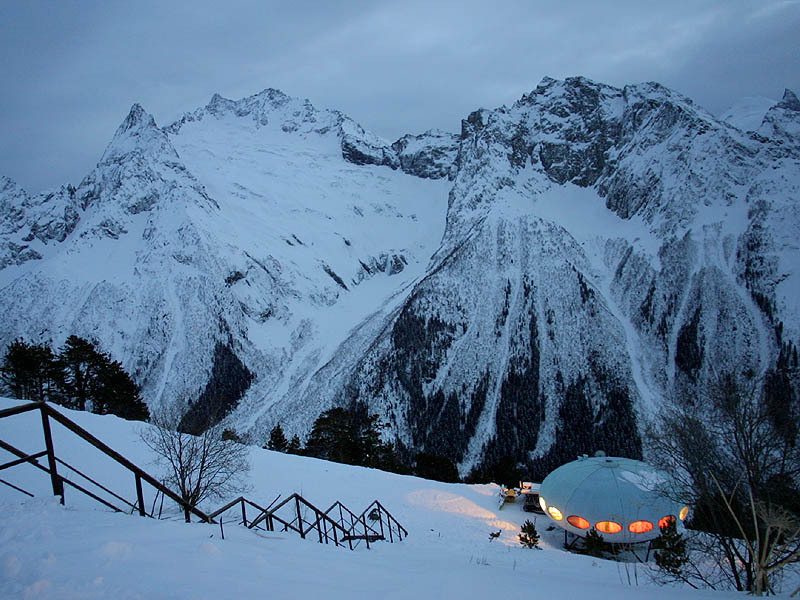 Experienced rescuers is always ready to help those who are in distress in the mountains. Photo by our reader A. Chuprakova"
It is of course the mention of the use of the Futuro as a search and rescue station that is most interesting as I have not heard mention of the Futuro serving in this role previously. Bing Maps now has updated satellite imagery which clearly shows the Futuro. I have slightly edited the lat/long for this Futuro based on this new imagery which proved that the previous lat/long was slightly off. 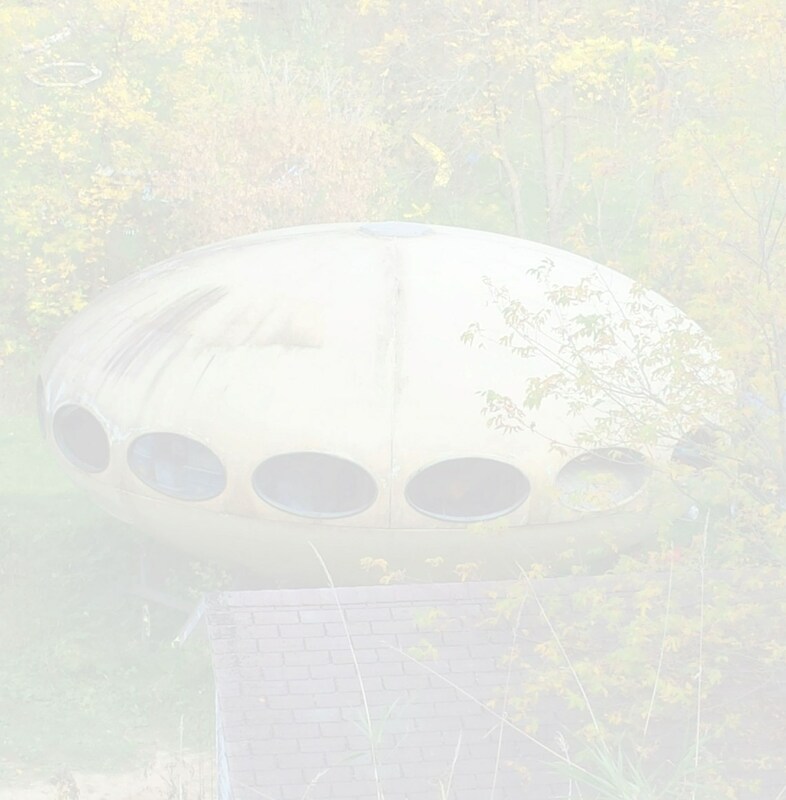 Google Maps still does not have imagery which shows the Futuro. 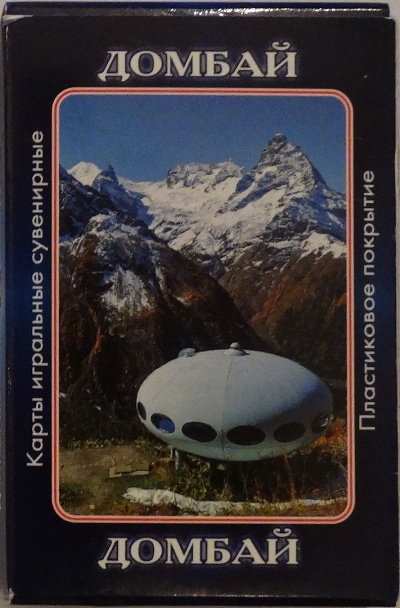 "The Finnish presenter of the "Caucasia in 30 Days" interviews a Russian guy who was in the team that assembled the Futuro on Dombai back in 1976. The team included four Finnish Futuro specialists from Polykem plus Russian helping hands. 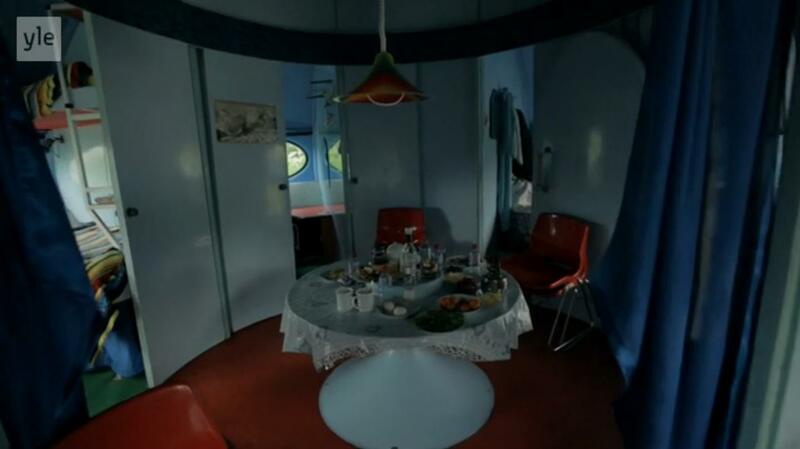 The program was shot in 2014 and includes nice exterior and interior scenes of Dombai Futuro." The show can be viewed around the world on the TV station's website using this link but only until 041215 so check it out while you have the chance. The Futuro section starts at approximately 36:30 and runs about 5 minutes. I grabbed a couple of screenshots from the video and added them at left. Hopefully this is not too much of a copyright infringement, I am not showing the footage after all, and this way there will be at least a couple of shots after the footage is no longer available on the TV Station's website. In a short post on the website Dark Roasted Blend the writer suggests that the Futuro is "Seemingly a knock-off of the "Futuro House" ..." There is actually no reason to believe it is not a Futuro and the author gives no basis for the statement. 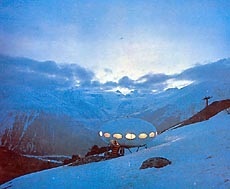 The article also reports that it was "built" in 1979. That seems unlikley to me as, based on all of my research to date, production of the Futuro had ceased several years prior to that. 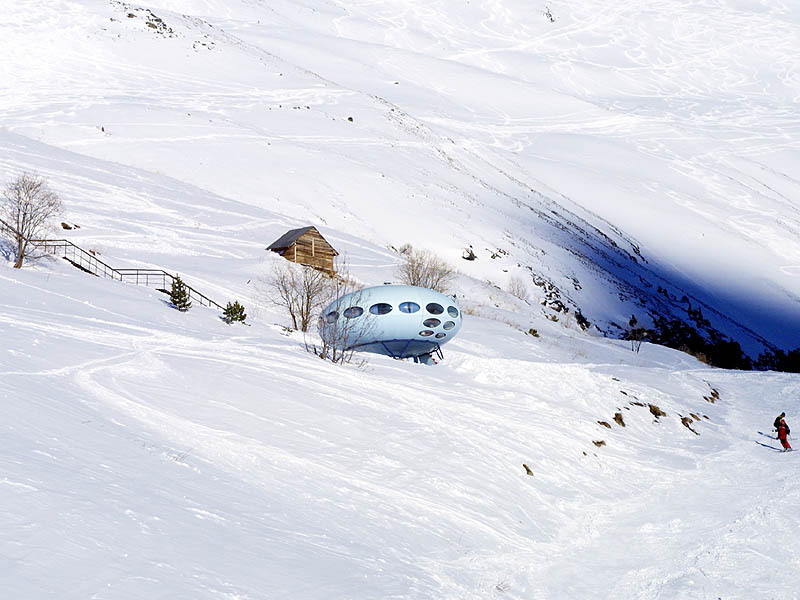 The Hotel Tarelka is located in Dombai, Russia high in the Caucasus Mountains and is home to a Futuro. Given that the original idea behind the Futuro was for it to be used as a ski-cabin the Futuro in Dombai is probably the only remaining example with a use that, while not exactly as intended, is pretty close to that originally envisioned by Matti Suuronen back in 1968. 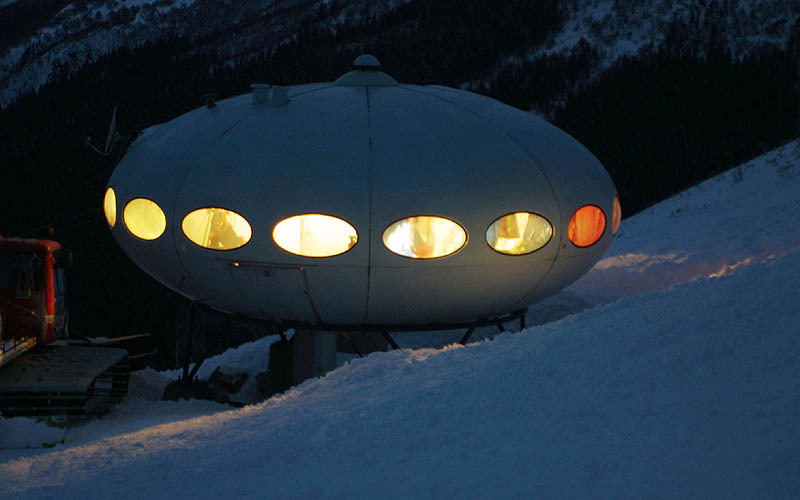 The Hotel Tarelka is not a typical hotel; it is not located at the bottom of the ski slopes but rather it is way up on the mountainside. 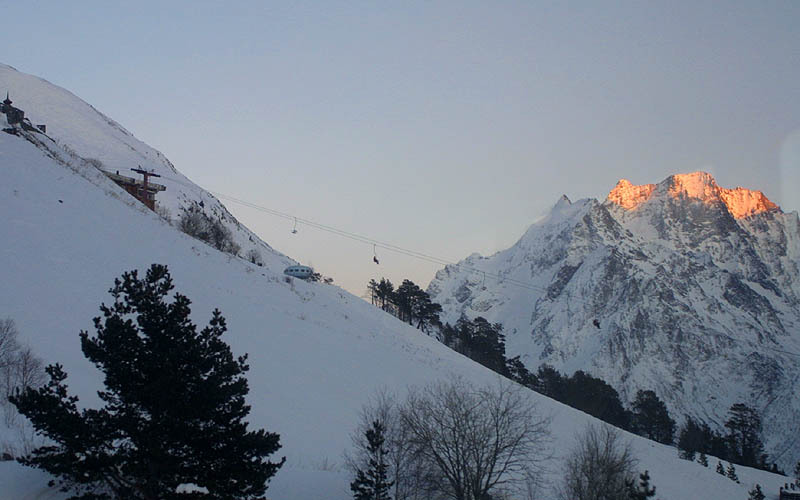 The Hotel information suggests getting down into the valley late at night or early in the morning is difficult because the funicular is closed. 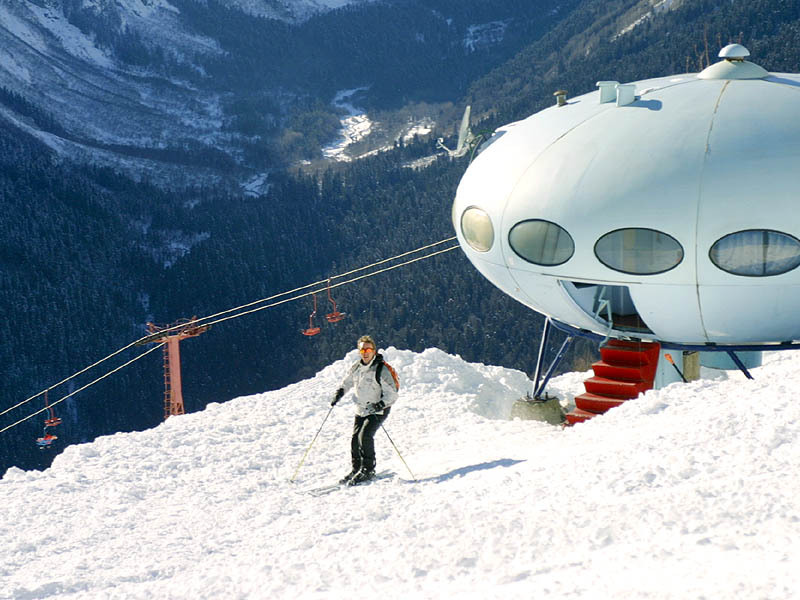 If you have an early flight home after you trip you either need to ski down [with your luggage - I am not a skier but that does not sound like much fun] or spend your last night in the valley at a different hotel. The benefit for that restriction? When you get up in the morning you are already up the mountain and ready to ski; not lining up with everyone else to get up the mountain. 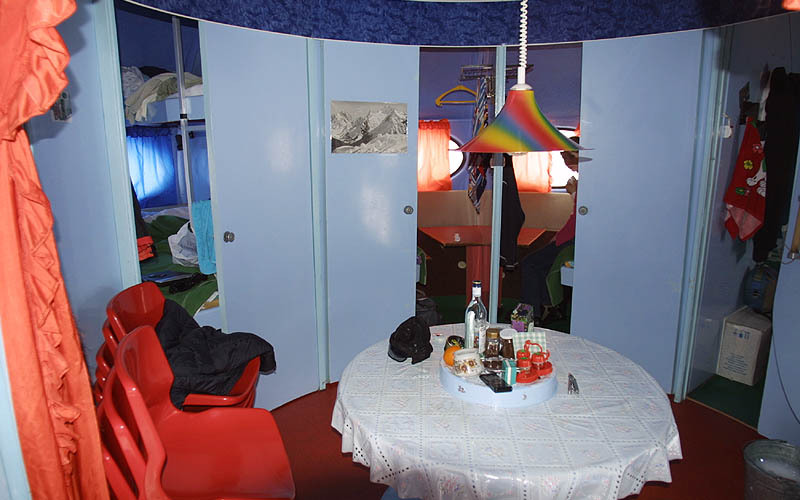 The Futuro acts as the "mess hall" for the hotel which is really a group of cabins that can accommodate 8 - 12 people that is normally rented out en masse. 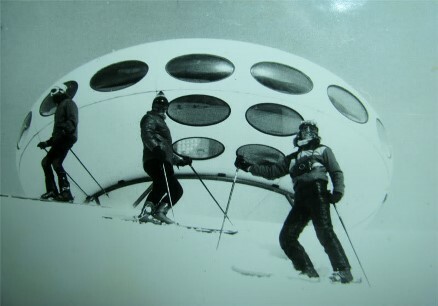 So, if you are a skier and a Futuro fan what could be better that the Hotel Tarelka? 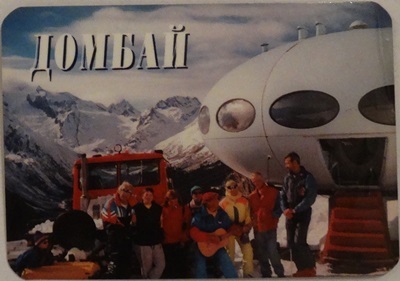 You can get more information about the hotel on the Dombai.info website or maybe you just need to call that travel agent of yours. This photograph by enginerusheff taken 120318.